A single percussionist taps away in his New York apartment. The camera pulls slowly wide filling that 3-story LF screen with a 5-story building hosting open-windows full of percussive residents. But this film stomps right out of the States and around the world. 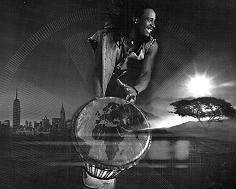 Africa to America, citizens of the world, pound, stomp, dance, sing, smile. A heard of caribou charge, then dissolve into a NY subway. A New Yorker stands atop a tall building winging a howling instrument, an aerial shot cuts to Red Canyon where a native American spins the same instrument -- threading, weaving, the fabric that makes all of us human. The film sows the cloth of music into a cultural quilt that covers that huge IMAX screen with warmth, comfort, and a spirit that beats with the strength of the collective human heart. Kodo drums in Japan, church Bells in England, dance in Spain, elephants in India, painted performers of Brazil, even underwater -- wordless, this production speaks volumes in rhythm and picture. Even if you've seen "Stomp" (the stage show), you still have to see this! Pulse: A Stomp Odyssey. Copyright © 2003. Created and Directed by Luke Cresswell and Steve McNicholas (the Creators of Stomp). Produced by Walden Media, Yes/No, Giant Screen.